It’s an art lover’s paradise, basically. So, bad news first: The first season of Restored by the Fords officially wrapped last night. The good news is that the HGTV hit show has been renewed for a second season, meaning this isn’t the last we’ll see of brother-sister duo Steve and Leanne Ford. The even better news? 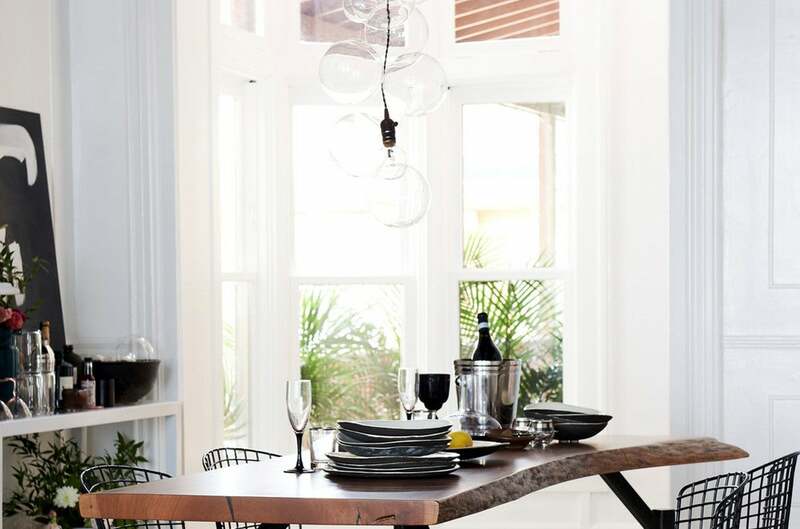 We caught up with Leanne to get the inside scoop on the stunning home featured in the season one finale—and it’s definitely one for the Pinterest boards. As with the other homes featured in the show, last night’s was an aging Pittsburgh house in dire need of some TLC. Situated in the North Side of the city, the traditional row house was dark, closed in, and wallpaper-heavy (and not in a good way). Which meant the first order of business was brightening the home to restore it to its full potential. Because it was a row home, the only windows were on the front and back of the home; breaking the entire back wall and creating one massive glass window allowed for a steady stream of light to flow in to the now larger-looking kitchen. Relocating the first floor powder room from the back wall was another big project that took work, but paid off in the end—though according to Ford, it proved to be one of the more difficult obstacles the duo faced in the redesign. Other architectural changes included adding a box trim to the walls—to create height and add detail—incorporating brick tiling in the kitchen to mimic the exterior of the home, and restaining the wooden floors with a matte natural poly to bring a fresh, clean feel to the space. They covered one of the built-in fireplaces with concrete for a modern feel. Despite these contemporary updates, they did keep a few of the more classic features intact, such as the marble fireplace. The main source of inspiration was the homeowners themselves. A young couple with a love for art and a passion for supporting local artists, they already owned several gorgeous pieces. The Fords chose a simple black and white theme to act as a canvas of sorts, allowing the art to take center stage throughout the home—from unframed canvases to even the light fixtures, which acted as sculptural accents in their own right. One standout art piece is slightly bigger in size. The black and white front staircase, inspired by a combination of street graffiti and Cy Twombly, is the work of artist Carolyn Kelly. Ford was particularly inspired by the street art motif when picking materials for the home, such as the concrete and brick in the kitchen. The space, which Ford dubs “Paris meets Berlin meets Pittsburgh,” may be inspired by the clients’ love for art and the local scene, but the largely whitewashed aesthetic is reminiscent of Ford’s own personal style. In her own restored 1945 farmhouse, Ford relied on a white-on-white palette, using materials to bring in some contrast and creating a calming oasis in the process. Though this Pittsburgh artist retreat is definitely a step in the bold direction and uses more noticeable pops pops of color in the artwork and smaller decorative pieces, the backdrop remains relatively minimalist. As for Ford’s favorite part of the home? The aforementioned staircase; the biggest piece of art in the house and one that successfully navigates that tricky balance of neutral minimalism and edgy design. We’ll just have to wait until the second season of Restored by the Fords to see what she creates next.